• In a victory speech, he promises to be "president of all the French people"
• Conceding defeat, Socialist Segolene Royal vows to "keep on fighting"
PARIS, France (CNN) -- Conservative Nicolas Sarkozy greeted news of his election Sunday to a five-year term as France's president with a vow to serve as a leader for all people of France. "The president of the republic must love and respect all the French," he told cheering supporters at his campaign headquarters. "I will be the president of all the French people." Sarkozy won with 53 percent of the vote in Sunday's presidential runoff, according to preliminary results issued by the French Interior Ministry. Socialist Segolene Royal took 47 percent of the vote. "The French people have called for change. I will carry out that change, because that's the mandate I have received from the French people." But, he added, "Friends can think differently." Sarkozy said he would also work to form a link between Europe and Africa. "We have to overcome hatred to give way to the great dreams of peace and civilization," he said. "It's time to build a great Mediterranean union." Sarkozy said he would put in place an immigration policy "that is going to be controlled" and a development policy "that is going to be ambitious." But he said that France would "stand next to" those who are persecuted by tyrants, dictatorships." "We are going to write together a new page of our history. This page, my dear fellow citizens, I am sure it will be great." Royal, a 53-year-old mother of four, acknowledged her defeat in a speech to supporters moments after the polls closed at 8 p.m. (2 p.m. ET). Sarkozy, a former interior minister, and Royal were in a runoff after emerging as the top candidates from the first round of voting on April 22. 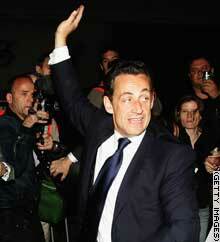 Sarkozy will replace Jacques Chirac, a conservative who has been France's president since 1995. His election makes him the first French president born after World War II. Voting was brisk. According to official figures, more than 75 percent of registered voters had been to the polls by 5 p.m. (11 a.m. ET). Sarkozy voted in the affluent Paris suburb of Neuilly-sur-Seine where he lives, while Royal cast her vote in the western Poitou Charentes region, where she is regional president. The campaign had been dominated by a debate over how to improve economic growth and reduce unemployment among the young, but its most explosive moments focused on immigration. Appealing to right-wing voters, Sarkozy said France could not provide "a home for all the world's miseries." On Friday, Royal said a Sarkozy presidency could trigger violence and brutalities in suburbs with high immigrant populations, prompting Sarkozy to condemn her "threatening comments." There are no official figures on the number of North African immigrants and their French-born descendants in France. Unofficially, the number is estimated at between 3 million and 6 million. Prior to the election results being made public, Sen. Richard Lugar, an Indiana Republican, said a Sarkozy victory would be favorable to the United States. "Clearly, his views are more in line with ours," Lugar told CNN's "Late Edition With Wolf Blitzer." Sen. Charles Schumer, a New York Democrat, concurred: "I do. I do," he told CNN. "I mean, it would be nice to have someone who is head of France who doesn't almost have a knee-jerk reaction against the United States." Newly elected Nicolas Sarkozy: "I will be president of all the French people." Do you think Nicolas Sarkozy will make a good president of France?